I just received a link to an old Powerpoint (PPT) presentation that was featured at an October, 2002, Pharmaceutical Marketing Research Group (PMRG) conference. The presentation was entitled "Positioning Detrol (Creating a Disease)" and the presenter was Neil Wolf who, at the time, was Group Vice President at Pharmacia, the drug company purchased by Pfizer. As you may know, Pfizer is preparing Toviaz, a follow-on drug to Detrol, for marketing (see "Detrol v. Toviaz: Marketing Replaces Innovation at Pfizer!"). The presentation outlines the strategies used to convert a "niche product into a Mass Marketing Opportunity." Download it here. 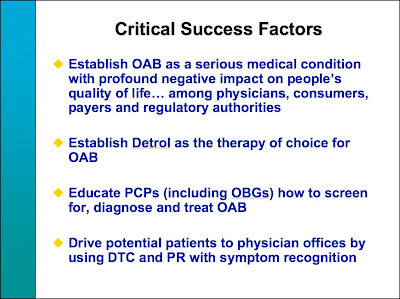 I was gratified to get my hands on this PPT because I remembered being present at the 2002 meeting and how shocked I was that a pharmaceutical VP would actually be so transparent in discussing how "overactive bladder" was a "new" disease that he and his company created specifically to increase the sales of Detrol! Often, I wished I had a copy of that presentation to prove that I wasn't imagining things and now here it is. How many have heard of overactive bladder? How many have overactive bladder??? 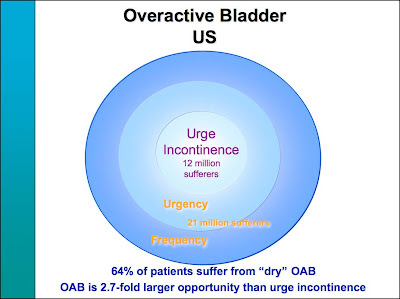 Some critics of the pharmaceutical industry say that overactive bladder (OAB) is an example of "disease mongering," a term that was coined by the late journalist Lynn Payer to describe what she saw as the confluence of interests by some doctors, drug companies, patient advocacy groups and media in exaggerating the severity of illness and the ability of drugs to "cure" them (see "Disease Mongering -- Is it real or not?"). I believe this presentation is a classic "disease mongering" case study. Slide #20 shows how by creating a "new" disease, the potential market for Detrol could be increased 2.7-fold! This is now the classic formula for creating greater demand for an Rx product than would normally be the case. As you can see, "education" of PCPs (primary care physicians) is a critical component as is DTC and PR (public relations). The American Medical Women's Association (AMWA), which is cited as a resource on the Detrol product Website, is currently promoting an "Overactive Bladder Initiative," which includes a "comprehensive continuing medical education curriculum" that provides "primary care providers with the latest discoveries concerning etiology, epidemiology and treatment of urinary incontinence, with particular emphasis on practical management strategies of overactive bladder, particularly as it affects women." AMWA lists Abbott, Novartis, Astrazeneca, and Wyeth (recently purchased by Pfizer) as corporate sponsors. 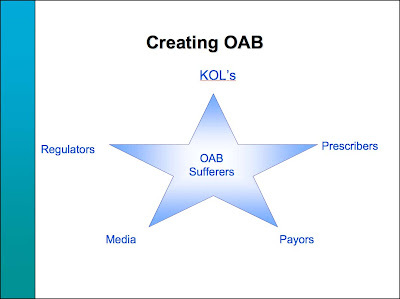 To get payors (ie, insurance companies) to place Detrol on their formularies and pay for OAB treatments, Pharmacia convinced them that OAB was "a serious medical condition, not just a 'lifestyle' disorder" citing "Skin and soft tissue infection," "Falls and fractures," "UTIs," and "Significant co-morbidity with depression and sleep disorders" (slide #39). Interestingly, none of these "serious" conditions was ever mentioned in the DTC marketing of Detrol. That might be just too much education for consumers to swallow! That is a poorly done slide deck and there is no company logo/insignia on it. Your Detrol post and the present one are great - your blog is buzzing. Overactive pharma marketing caused overactive bladder disease!! Overactive bladder is a problematic disease and Detrol hs helped tremendously in treating mine. Calling OAB a "lifestyle" disorder is a disservice to patients. The TV commercial are silly showing just one of several ways the disease presents and the advertising of detrol played no role is diagnosing my issue. As a PharmD., I know that side effects have to be balanced against benefits and in general side effects are class effects related to the mechanism of the agent prescribed. It is also important to note that side effects listed in the PI may have nothing to do with the drug, but were repoted during the study and must be included in the label. To be clear I have no affiliation with any product or company. Great post, John. It's hard to image that someone actually recorded this thinking for posterity! But thanks for sharing. It's definitely one of those "have to see it, to believe it" items. I would say that while the term "lifestyle disorder" may not be as severe a term as those suffering from OAB might think it warrants, I wouldn't go so far as to call it a disease. The word "disease," in my opinion, is used much too liberally and should be reserved for life threatening or totally incapacitating ailments - things like cancer and cystic fibrosis. OAB (again, in my opinion) is best classified as a "condition," and while unfortunate and inconvenient, definitely not life-threatening. All of that aside, the point is pharma has spent way too much time "marketing" new, so-called "diseases" and not enough focused on solving the unmet patient needs of those suffering from actual diseases. For more than a decade, pharma's been in the business of developing sales strategies, not breakthrough therapies. It's spent so much time figuring out how to sell the tenth iteration of statins or nice-to-have "lifestyle" drugs, that's it's forgotten how to innovate. Truly innovative therapies that treat real patient needs will sell themselves. If we really got it right, and truly serve the needs of patients, they'd be beating our doors down for our medicines - no sales force required. As usual, this is a little more complicated. While it is easy, and maybe correct to critique aggressive marketing tactics of Pharmacia, it is also true that patients with OAB suffer greatly. Incontinence and urgency cause them to curtail their social activities, feeling lonely and embarassed. Can you imagine what your life would be like if you leaked urine every 30 to 60 min? Detrol does offer a solution to that problem. Pharma sometimes does a REAL service by increasing awareness and understanding of health conditions. One of the most profound examples is Hypercholesterolemia and Merck. I think most docs would agree that the detection ad treatment of hypercholesterolemia has had a profoundly positive impact on the health of their patients. I see you had to dive deep into the past to come up with a case where the drug industry developed a product that may actually have saved millions of years of life of patients. It's hardly fair to compare OAB with hypercholesterolemia. In any case, the bigger issue for me is how some pharma marketers take pride in "inventing a disease." The author of this PPT presentation used that phrase, not me! At the very least, this was a very big PR error! Perhaps the error is in describing the actions of Pharmacia/the pharma industry as "inventing disease". In the case of OAB, Pharmacia (and later Pfizer and others) provided an acceptable name for the condition, increased awareness, and provided access to effective treatment for a large group of patients(women especially) suffering a hugely difficult condition. Your wife, your choice - diapers or Detrol?